At some point you will inevitably stumble across this term "Enriched Air Nitrox" or "EANx Diver". In short Nitrox is a gas mixture, just like our normal breathing. Our ambient air on Mother Earth that we do constantly breathe, roughly consists of approximately 21% oxygen and 79% nitrogen. We need oxygen to keep our body "running". However - Nitrogen is useless to us but also not harmful. With each exhalation, we just get rid of that Nitrogen. But - if we breathe Nitrogen under pressure, so for example underwater from a compressed air tank, nitrogen has a negative impact on us. Each Open Water Diver knows one of these effects. After a dive we feel a little sleepy. That's not bad, if at all - just a little annoying. However, breathing too much nitrogen in areas of high ambient pressure (deep dives) also has serious side effects. This topic is covered in the basic Open Water Diver course in Chapter 4 (you remember?). Enriched Air Nitrox divers use a trick to minimize these negative effects of nitrogen. They use gas mixtures containing more oxygen and less nitrogen (eg 32% oxygen and 68% nitrogen content). The advantages are obvious. The sleepiness after diving does not occur as "strong". More important is that by the reduced nitrogen deep dives are safer than deep dives with normal air. Because the risk of decompression sickness is significantly reduced. Furthermore, you can say that your decompression limits (ie how long you are allowed to stay at a certain depth) are extended. So you may stay longer on deep levels than the Table (RDP) does allow you on "normal" compressed air. So only advantages! Why not always get this oxygen-enriched gas mixtures on every dive? Well, this is the trend in fact. EANx is definitely the "diver air of the future". 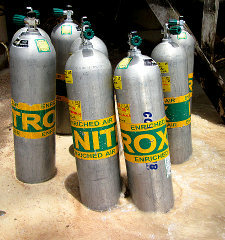 Nevertheless, a not "Nitrox"-certified diver can not simply dive with EANx. 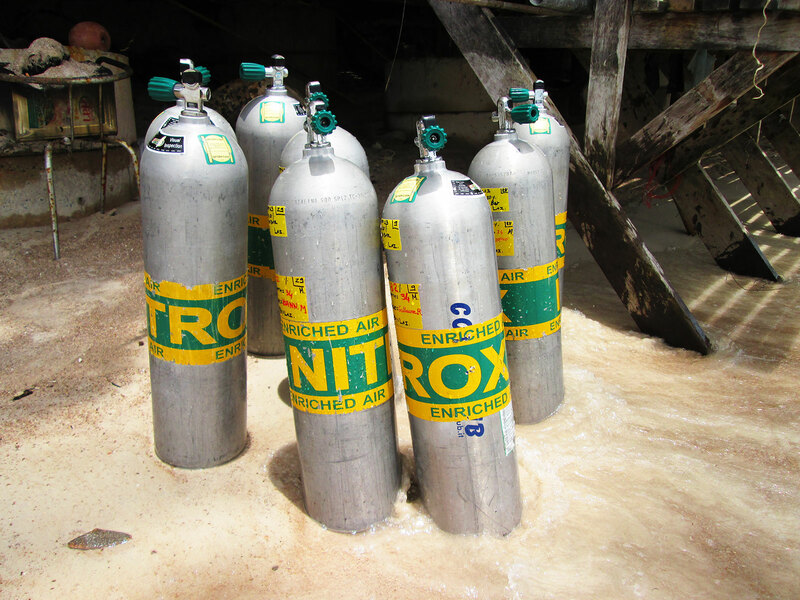 Why an extra Enriched Air Nitrox specialty diving course? Enriched Air/Nitrox divers do have many advantages, but there are certain rules to be observed and adhered to. Enriched Air Nitrox is a manufactured gas mixture which is filled by a qualified "Gas Blender" with the desired oxygen content in the tank. Trust is good but control is better. So an Enriched Air/Nitrox diver learns therefore how to deal with an analyzer. The analyzer measures the proportion of oxygen in the gas mixture to ensure it is exactly the expected gas mixture in the tank. High concentrations of oxygen can have a toxic effect on the human body. As Enriched Air Nitrox diver you learn your limits up (or down) to which you can go with your gas mixture.